With the bicentenary of the Battle of Waterloo coming up on 18 June, it came to my mind how many Napoleonic scenes Eyre Crowe produced during his long career. Curiously, for an artist who exhibited at the Royal Academy in London, Crowe never painted anything from the point of view of the British army fighting in the Napoleonic Wars – but perhaps this is not so strange when we consider that Crowe grew up in Paris and maintained connections with his French friends and half-siblings throughout his life. His earliest paintings with a Napoleonic theme were shown as a pair at the Royal Academy exhibition in 1879 – Marat: 13th July, 1793, and Execution of the Duc d’Enghien, 1804. Hougoumont, June 1815, the day after the battle (1886) by Eyre Crowe A.R.A. Seven years later, ‘Hougoumont‘ garnered some critical acclaim. Depicting a group of defeated French soldiers after the Battle of Waterloo, Crowe’s original caption describes the scene: ‘Leaving Hougoumont, my attention was called to a group of wounded Frenchmen by the calm, dignified and soldier-like oration addressed by one of them to the rest. The speaker was sitting on the ground with his lance stuck upright beside him – a veteran lancer of the old guard, who had no doubt fought on many a field’. In 1891, a simple genre scene of a woman helping her son to write a letter was given a historical theme. Entitled Writing a Message to St Helena, it showed the Empress Marie-Louise – Napoleon’s second wife – and their son the Roi de Rome – writing to Napoleon in exile on the island of St Helena. 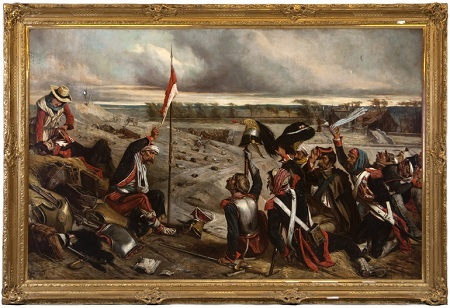 Another Napoleonic painting, exhibited in 1895, was quirkier. Le Petit Chapeau: The Hat Worn by the Emperor Napoleon at Waterloo, was a still-life of a large hat owned by Crowe’s good friend, the French painter Jean-Léon Gérôme. 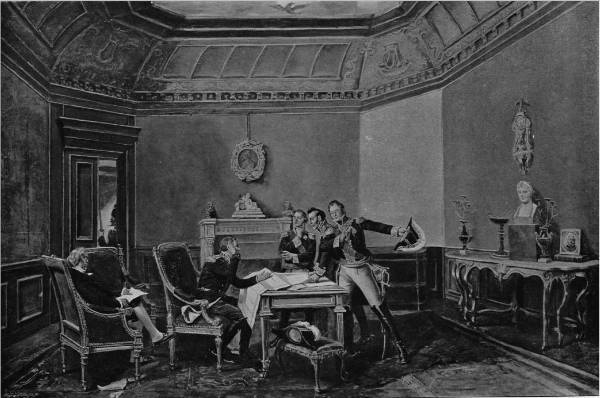 Crowe’s final Napoleonic offering was Napoleon’s Abdication (1902). Crowe’s artistic powers were in heavy decline by this point in his long life. It is hard to disagree with the opinion of the critic in The Builder, who described it as ‘… about the worst Napoleon picture ever painted’. Crowe even had the assistance of H.A. Bowler, the Royal Academy’s Professor of Perspective, in tackling the tricky octagonal ceiling, but clearly failed in making it convincing. Nevertheless, someone paid £14 for it in the auction of Crowe’s possessions after his death. This is one of the many Crowe paintings whose present ownership is unknown. Despite its artistic failings, it would be good to know if it is still hanging, cherished, on someone’s wall.